Notable gymnasts always stood out because they had their own original style of gymnastics with the most amplitude, difficulty or completely unique style. It is amazing that, even at the International Elite level, simple kips often sadly lack even basic swing amplitude. 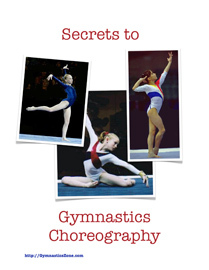 Teach gymnasts to swing into their kips! Learning all variations of kips is a way to improve gymnast’s kips and add variety to bar practice, and to also add kipping skills they will need later. Flyaway fulls are not a really common bar dismount, perhaps because knee injuries from them seems too big a risk for the value of the vault and double and triple twisting flyaways are even less common, but there is how to fix the problems. Doing Giants In A Cast!?! Some advice to a parent about her injured daughter continuing to work out doing giants while still wearing a cast. This time the coach answers 4 strap bar questions including… what types of bars to use, finding straps, and making your own gymnastics straps.